Abstract: After the biopsy, the doctor said it was TB. I was on antibiotics for six months. The lump in my lung grew bigger. This was then confirmed as lung cancer. Unfortunately it had spread to the liver. I underwent chemotherapy and radiotherapy. The lung tumour shrunk but later grew in size. The liver lesion increased in number, from 1 to 3. I knew I was on the wrong track. My prayer was answered. I found CA Care. I took herbs and benefited from them. Then I went to China for more medical treatments. I was brought up in a middle class family and is the eldest in the family. Presently I am 55 years old. I am a non-smoker and non-alcoholic. I am one of those common people who are ignorant about healthy foods. I do not know what “junk” foods are. Four years ago, on 16 November 2001, during one of my yearly routine health check to renew the licence of my restaurant, my X-ray film showed a suspicious shadow in my right lung. After doing a few other tests, my family doctor advised me to go for further check up in Kuala Lumpur. On 23 November 2001, I went to P Hospital in Kuala Lumpur and did a CT scan. The result was not conclusive. The specialist told me that to be a hundred percent conclusive, a biopsy had to be done. A few days after the biopsy, the doctor came to my ward and congratulated me. He told me that I only had tuberculosis and not cancer. My medical report showed necrotic nodule suggestive of tuberculosis. I was very happy. He then instructed my family doctor to treat me with a full dose of TB drugs lasting six months. Both my lower limbs were numb but my doctor told me that it would disappear after I stop taking the TB drugs. I later learned that the drugs consisted of four types of strong antibiotics. During this period I was ignorant of the medical world. I am a businessman. I have a restaurant and a retail shop that my wife helped to look after. The business was good and from the profits we earned I went into construction business. When any member of the family become sick, we naturally go to our family doctor for advice. This is normal and acceptable practice not only for me but also for most other people. Unfortunately for me, I learnt later that I need to take responsibility for my own health. In March 2002, I had coughs. I thought it was only my TB and was not worried. On 6 June 2002, my family doctor took an X-ray of my chest and found out that the irregular spot in my lung had grown bigger. I was then advised to go back toKuala Lumpur for further check up. I went back to P hospital and the specialist told me that it could be fungal infections and suggested that I undergo an operation but I told him that I wanted to have a second opinion first. The next day I went to GE hospital. A CTscan was done immediately. The specialist there told me that the lesion in my right lung had increased in size and an additional small lesion was found in my liver, probable liver metastasis. He then told me that from his experiences he is quite sure that it was cancer. It was then too late to have an operation because the cancer had already spread to my liver. He also told me that I should have requested my biopsy slides samples sent to Singapore for a second opinion. My first doctor did not advise me that. The specialist also told me that if a biopsy sample was tested negative, it should be sent for a second opinion, but if it was positive then not necessary! How do you expect a lay man like me to digest such a thing? He told me to see an oncologist, if not the cancer is going to kill me and I would have only about a year to live. On 1 July 2002, I consulted Dr. Y of T hospital and was admitted for a right bronchial aspirate cytology test. When the pathology report was out, it was confirmed the there were clusters of undifferentiated malignant cells, small cell type. No need to get a second opinion, was the advice! Frustrated, I returned to P hospital. I have spent more than RM 20,000 for a biopsy with a wrong diagnosis. As I mentioned earlier, I have always trusted and relied on the advices of doctors. But on this very important decision, they did not give me the correct advice. In my case, the biopsy was misdiagnosed. So cancer patient BEWARE, please learn from my experience. The surgeon in P hospital then told me that he could still do an operation for me but he has to do an arterial chemotherapy in which my main arteries to the lung will be blocked by a special filter (a new therapy) and very strong chemo-drugs will be used to shrink the tumour. Then the tumour in the lung would be resected. As for the small lesion in my liver, it could be vapourised by another treatment. I did not understand what he meant by “vapourised”. The whole treatment would cost me RM 100,000 (one hundred thousand ringgit). I refused to go along with his advice and decided to seek a third opinion. Not satisfied, I went to another hospital in Kuala Lumpur, and every doctor recommended chemotherapy and radiotherapy. Very tired, worried and exhausted and without any other option, I finally accept the therapies recommended by the doctor – go for chemotherapy and radiotherapy. I am not so lucky to have known CA Care at that time. I never knew it even existed. On 10 July 2002, I started my radiotherapy. The treatment was done everyday, except Saturday and Sunday. I had a total of 25 sessions of radiation. The first shot of chemotherapy was also started the same day as I started radiotherapy. The chemo-drugs used were: Gemcitabine, Carboplatin and Navelbine. On 4 September 2002, after the third chemotherapy, the tumour in my lung shrunk! I am happy and my doctor was also happy. He told me I am progressing very well and he gave me a pat on my back. 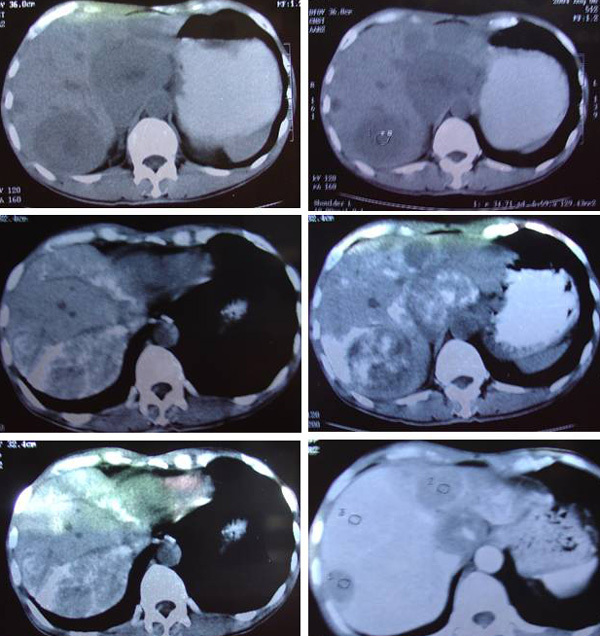 I asked about my liver metastasis but he replied that it was not necessary to do anything about it yet. I stayed in Kuala Lumpur for two months until I completed my radiation treatment. As for my chemotherapy, I traveled from Sarawak to Kuala Lumpurevery three weeks. I rested for about a week until I regained my strength before I returned to my home. Immediately after my first cycle of chemotherapy, my oncologist prescribed me anti-vomit tablets. I did not feel hungry during lunch or dinner but I forced myself to eat some porridge with fish and vegetarian meat (mocked meat). I vomited even though I took my anti-vomit tablets. My body temperature rose to around 38 degrees and the rate of my heartbeat increased to between 95 to 110 per minute. My doctor prescribed me Atenolol 25mg (Atehexal) pills to reduce my heartbeat. I had fevers, which did not subside with medication. At night I could not sleep because I coughed whenever I tried to lie down. I have to lean on the wall of my bedroom to get some sleep. The doctor then prescribed me some cough syrups but they were useless. Sometimes, I woke up during the night and my whole body was soaking wet with sweat. I had to change my pajamas very often. The bedroom was air-conditioned but I felt hot. My wife did not feel warm at all. I urinated three to four times each night. My tongue was also covered with a thick whitish coating. I scrape my tongue but the whitish coating would not go away. After a few weeks, I coughed whenever I talked. So I learnt to talk slowly and lowered down my voice. But I still coughed in between. My coughs had thick phlegm and I felt breathless after climbing the staircase. My vision was also blurred and my spectacles had become useless. I could not recognize my friends even at a distance of twenty-five feet. Sometimes, I saw only white lights in front of me, everything else was all blank. I learned not to cross roads unaided and stopped driving. Each time before the chemotherapy, my blood count was checked. Fortunately my body was strong enough to bear all these toxic-drugs without my white blood count lowered to a dangerous level. My hairs became thinner but I did not become bald. Without my doctors knowledge I took Chinese herbal concoction (not CA Care herbs) recommended by other cancer patients. My weight dropped to 118 pounds from 130 pounds. My fourth, fifth and sixth chemotherapy was done on 2 October, 30 October and 20 November 2002 respectively. On 26 December 2002, an X-ray of my lungs showed some fibrosis and pneumonitis. I was prescribed two months of cancer pills, UFT(consisting of Tegafur + Uracil by Taiho, Japan). I was asked to take three capsules per day after food. An ultrasound on 25 February 2003, showed that instead of two small nodules in the left lobe of my liver, a new mestastatic nodule in the caudate lobe measuring 1.6cm x 1.2cm x 1.2cm was noted. On 21 April 2003, an ultrasound showed all the three nodules had increased in size. My oncologist in Kuala Lumpur did not say anything and when I asked him why? He replied, “I have already given you a very strong chemo”. From this remark I knew my oncologist had given all that I needed to have. After considering all the reports and information that I learnt, I knew that this was not the right path to pursue in my healing journey. Then, a thought came to my mind. Why not try holistic healing? I was looking for a correct herb ever since I was diagnosed with cancer. And I have been taking many types of herbs introduced by friends and relatives, but none seemed to have helped me. Then one day, my prayers were answered. I went to a bookshop to “hunt” for a herbal book for cancer. I always have this thinking that herbal books are always written in Chinese. I never thought that the one I ought to be looking for was written in English! While in the bookshop, my eldest daughter suggested that I should also try searching the book in English section. An important message from God was conveyed through her! I found a book entitled: CANCER SUCCESS STORIES Book One – In Search of a Cure by Dr. Chris K.H.Teo. This was the one and only book on cancer displayed on the shelf. And there was only one copy. After reading this book, which took me three days, I knew that I was on my way to another option of healing. Without wasting much time, on 22 May 2003, I faxed to Dr. Chris Teo for herbs. I received the herbs from CA Care on 26 May 2003. I immediately boiled them and finished the last concoction at 12:40 a.m. – late into the night. The next day, I passed out soft stools which were dark and very smelly. I passed off smelly gas and my coughs had sticky phlegm. Four days on the herbs, my coughs were better. I felt less breathless when climbing staircase. The whitish coating of my tongue became thinner. I knew I was feeling better already. After brushing my teeth, one morning of 31 May 2003, the whitish coating on my tongue was gone. Gone after eleven months! I was surprised and very happy. I compared my tongue with my wife’s and they were the same. Believe it or not, my wife touched my body and arms and they were not hot like before. I knew my temperature had gone down too. I am still taking my Norvasc pill, 5 mg per day because I have high blood pressure for the past three years. On 4 June 2003, when I was discharging my phlegm in the morning there was some blood in it. I said to myself, it must be due to my strong coughs. True enough it was gone in the evening. My health improved tremendously after taking CA Care herbs for only a few months. After about a year of taking the herbs and healthy foods recommended by Dr. Teo, my blood pressure became normal and my family doctor told me not to take any more Novasc pill. My blood pressure was 120 over 80 without the pills. I led a normal and pain-free life. 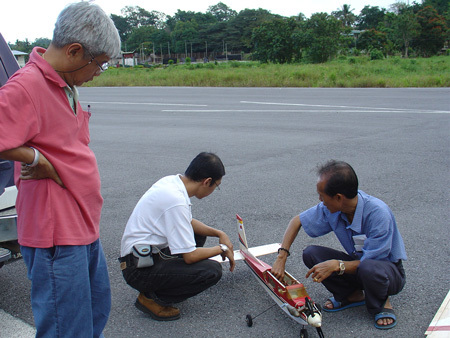 I was able to continue with my hobby – flying my remote controlled helicopter and aeroplanes. However, in spite of the herbs, my liver nodules kept growing in size. In July 2004, I wrote to Dr.Teo that I wanted to consult with the president of a Chinese hospital. I went to see this doctor who told me that I have five tumours in my liver and three of them were around 5cm in size. I requested Dr. Teo’s opinion whether I should proceed to treat these nodules by cryoabalation, which is a new concept and non-toxic treatment available in China. Dr.Teo encouraged me to go ahead. It was worth a try. When I first arrived at this hospital in China, I had to pay a deposit of RM 2,500. The doctor did a CT scan on my lung and liver on 6 August 2004. On 9 August 2004, they proceeded to do a transarterial intervention chemotheraphy on my lung and liver using NVB+THP+LP. The doctor talked to me during the treatment. A tube-like probe was inserted into the artery through my thigh. I felt no pain. I could see the process done step by step. The tube was inserted to the tumour and chemo-drugs were injected into it. The cost of this one-hour procedure was RM 7,500. I was then given ten days to recover and during this time I was put on drips. After I recovered from the first treatment on 18 August 2004, the doctors did cryoablation on my liver. Since there were five tumours, eight probes were pierced through my abdomen. During the process, I could still hear what the doctor was saying: Open gas for needle 3, close needle 1, etc., etc. There was no pain and I was half awake. The treatment lasted about one and half hours. This procedure cost RM 7,500. It took me fourteen days to recover from this treatment. After the cryoablation, I had pains at the liver and abdomen area. I had to stay in bed and even had to urinate in bed. However, after a week, I managed to get out of bed and walked a bit. After I recovered, on 31 August 2004, the doctor did cryoablation on my lung. This was quite easy, about half an hour’s job. I only saw one tumour and did not suffer anything much. By the second day, I could get up and walk. However, I coughed out fresh blood after the treatment. The doctor told me that this was good sign. The cough lasted for only a day and after that I was problem free. The lung treatment cost me another RM 6,000, which was cheaper.They gave a discount for a second treatment. During the hospitalisation period, I was given anti-tumour immunotherapy. I was also asked to take herbal concoction and two types of herbal capsules. A dose of herbal concoction cost RM 30 and this is to be taken twice a day with the capsules. I was not allowed to take CA Care herbs then. My stay in the hospital was indeed a pleasant one. The patient-friendly hospital has air-conditioned room which cost me about RM 75.00 per night with 2 beds, a television set, a refrigerator, and an attached bathroom. Believe it or not, I could have my whole family staying in my room while I was on treatment! There is no visiting hour and there is absolute free access. But security there is very tight. I could also cook in my room. This new concept of environment suited my healing. A home away from home, and free from any stress due to “unnecessary” or rigid formality. The total cost of my treatment was about RM 40,000 inclusive of the thirty-one days’ stay in the hospital for me and my wife. When I returned home on 6 September 2004, I still had pains in my liver area. I had to curl up or bend my body – I could not put up my body to an erect position. I could not walk much and had to lie down and I felt very weak. But after I started to take Capsule A+B, Lung 1 and 2, Liver P and Pain tea, all pains were gone within three days. Then, I was able to go to my shop and work. On 11 October 2004, I wrote to Dr. Teo to inform him about my progress. I informed him that once again CA Care herbs had benefited me. All the pains were gone and I was very energetic. I could eat and sleep well, went on my normal works and as usual fly my remote controlled models. I was very happy and have gained 3 lbs since I came back from the treatment. I also informed him that I would not stop taking his herbs. In November 2004, I had the privilege of meeting Dr. Teo in China when he was invited by the president of the hospital for a friendly visit. I was then in China, having my follow up treatment (after three months). The doctors told me that my largest tumour which was originally 8 cm had shrunk to 3.6 cm. There were no additional tumours in my liver and lung. The feared metastasis did not occur. My wife and I were very happy and Dr. Teo was there to share our happiness together. Then I was asked by the Chinese doctor there to repeat the treatments i.e., to undergo chemo-embolisation and cryoablation again. I declined further treatment preferring to wait and see. After I refused to undergo further treatment, in spite of repeated persuasion to do so, I was accordingly discharged. I sensed an ill taste was reflected when I told the doctor-in-charge that I preferred to monitor my liver tumours locally and should the tumours increased in size I would then return to repeat the ablation treatment. Up to that stage I was doing fine and was in control. But it was too early to make any conclusion. Cryoablation by itself is not a cure. When I was in China, I visited other cancer patients and many of them told me that their cancer had recurred and they had to come for the second or third treatments. In a few cases the recurrence period was only two or three months. I also found out that these patients did not follow any proper diet and most just did not care about their diet. I advised my fellow cancer patients to keep to a proper and healthy diet as this could prolong the time of recurrence of their tumours. From the experience of others, I knew that I have to keep to my diet and take herbs if I want to heal myself. I am well aware that my healing journey is just the beginning. I have to be very careful in choosing the right route. I hope God will guide me to it. With the help of my family doctor, I continued monitoring my liver and lung regularly. Then one day in July 2005, during one of my usual visit, my doctor discovered that my biggest liver tumour had increased in size to about 10 cm. I knew that something was not right. I immediately referred the matter to Dr. Teo in Penang. After careful considerations, I decided to go for Radio Frequency Ablation (RFA) in Kuala Lumpur. I was admitted on 8 August 2005 and a CT scan was done. After the report was out, the doctor told me that RFA treatment was not indicated as the cancer had spread to my pancreas.The doctor recommended chemotherapy as the best option. I refused as I was seeking a non-drastic treatment. I went to another hospital in Kuala Lumpur besides sending my medical reports to a Singapore hospital. No one was able to provide me with the treatment that I WANT. If I were to follow the advices of all these doctors, I would have ended up with more CHEMO. One specialist told me: Mr. Chew … The chemo-drugs are more advance now……it’s not like before. You can try them. They are good for you. “Yes, maybe more toxic than before,” I said to myself, feeling very sad. After evaluating all the above advices and recommendations, I decided to return to my hometown in Sarawak and for the first time made a whole-hearted decision to return to China for the second time to continue my treatments. I went to China again on 29 August 2005. After studying my CT scan taken inKuala Lumpur, the doctors proceeded to do a transarterial intervention chemotherapy on my lung and liver, which was exactly the same treatment done during my first trip in August 2004. After I recovered from this treatment, they persuaded me to have three small dose of chemotherapy. Two doses to be administered one after the other and the third dose eight days thereafter. After much persuasion, by the Chinese doctors, I agreed to the chemo-drug. But after the second dose of chemo, my hands and legs were swollen. I could not close my hands and my shoes could not fit me anymore. My heartbeat increased to more than 100. My urine was little. I vomited whenever I ate. My weight tumbled down. I refused the third chemotherapy and regretted that I had agreed to have it in the first instance. After I rested for about ten days, the doctors did cryoablation and at the same time did radio-iodine seed implantation into my liver and pancreas. Forty radio-iodine seeds were implanted. Each seed cost me RM 250. The doctors told me that the iodine seeds will transmit short radiation for two months inside my tumours. I have also made many telephone calls to Dr. Teo in Penang to report my progress. The foods sold at the hospital canteen were too salty and oily. As for me, my loving wife did all the cooking. She took care of me as I have to pass urine in bed after treatments. She massaged my back when I felt numb from sleeping in bed for too long. She sponged my body with a wet towel everyday. She spoon-fed me when I was unable to take food myself. She gave me encouragements when I was feeling down. She was like a nurse, a maid and a good companion to me during my treatment in China. I always treasure these moments. Everyday she would walk to the wet market, half an hour walk away, to buy fish, vegetables and fruits. She will cook and boil my herbs. Remember we were in a foreign country and on unknown territory. Who else could do these better than my own loving wife. During my stay in China I took CA Care herbs. This time the doctors did not object to their consumption and instead commented that the smell during the boiling was nice! In this Chinese hospital, if you are knowledgeable enough, you can choose or have your say regarding the treatment recommended by the doctors. This is patient’s rights. Otherwise, follow their suggestions and you pay a hefty bill! For example, why do an MRI costing 10,000 yuan when a normal uncontrasted CT scan cost only 800 yuan. MRI is in colour and very small details can be seen but CT scan comes in black and white but give about similar details. When I was there, the hospital organized a karaoke night to celebrate the Moon Cakes Festival with all its patients and their relatives. Patients are wheeled out to the open-air garden. Imagine some were still on drips. Mooncakes, fruits, peanuts, drinks were served. Professor Nui and other doctors gave speeches during the function. Some selected patients also gave speeches and flowers were presented to them. Everyone was happy that night. The doctor in charge commented that I was knowledgeable. Because of that they have to discuss and explain every treatment to me first before doing it. Normally they would not do this to other patients as they would not understand anyway. On 22 September 2005, I was discharged. The total cost for this treatment was RM 45,000 inclusive of my twenty-five days’ stay. The doctor told me that since I am a knowledgeable patient, I should be able to monitor my health myself every three months and should my doctor in Sarawak find any signs of recurrence, I should come back for further treatments. Below is a group photo of me and the friendly nurses who took care of me during my treatment in China. Immediately after I arrived home, I phoned Dr. Teo and told him about my safe arrival. I have to walk very slowly because I was very weak and my limbs were still swollen despite the medication prescribed by the Chinese doctor. I have lost about 3 kg. The next day, I took the Lower Edema herbs provided by Dr. Teo. The swellings subsided after a week. My strength also improved day by day. After about a month I recovered my normal strength and was as energetic as ever, living a painless quality life again. After two months I gained back my normal weight. On 27 December 2005, I went for a CT scan in a Sarawak hospital. The radiologist was unable to summarize my reports. He told me that he had studied my CT scan a few times and was unable to conclude what the reflecting spots in my liver and pancreas tumours were. I was called in to explain to him about my cryoabalation treatment and radio-iodine seed implant that I did in China. I gave him a copy of the Chinese doctor’s report. The radiologist compared the CT scans with my previous ones taken in Kuala Lumpur before my trip to China. He then said to me: I will complete the report in two to three days but I can tell you now that they have done a very good job on your pancreas tumour. Then I asked him about my liver tumours. As for your liver, the biggest tumour has been reduced to not more 5 cm. Those smaller ones appeared more or less the same…no change”. (The previous size of the biggest tumour was 10 cm). That was good news! I was very happy and in my heart I thanked God the almighty. I knew that God had answered my many prayers! My first trip to China last year was also successful but after a year my tumours had grown back to their previous sizes again. Now I knew that my tumours were small again, which was similar to last year’s situation. When the final report was sent to me, it has this remark, NO contrast was given based on the patients strong objection. The state-of-the-art medical technology in China had provided me with the treatment of my choice and which benefited me to a certain extent. I could control the tumours’ growth while I was on my healing journey. I have chosen this China route because the medical technology there is advancing very fast! During my recent treatment, my Chinese doctors had added radio-iodine seed implantation to my tumours. That was not available during my earlier visit. According to my radiologist and doctor in Sarawak, where I am monitoring my cancer, the Chinese doctors had done a very job for me. There is nothing more that I could ask! God had allowed my life on this toxic world to be extended. The rest of the healing journey is up to me. 1) Take my herbs regularly. The new liver herbs that Dr. Teo have specially prepared for me had benefited me tremendously. I am living a quality life and can do whatever I want. I can do my exercise, carry on with my normal works, enjoy my hobby of flying my remote controlled aeroplane and helicopter. 2) Drink fresh juices prepared from carrot, cabbage, broccoli, and celery every morning. In the evening I take salads half an hour before dinner or an hour thereafter. My wife is very creative in preparing these healthy juices and salads that provide lots of powerful nutrients and antioxidants. walnut and almond nut, etc. These nutritious and preservative-free drinks provide me and my family a radiant, energetic and healthy life. 4) Follow a very strict and healthy diet of natural whole-foods, grains, fish, vegetables, fresh fruits, beans, cereals, unprocessed foods and unrefined coconut oil. Sometimes, I also take molecularly distilled fish oil and spirulina or chlorella supplements. Regularly I take regularly supplement enriched with more than forty nutrients in a natural form that is essential to life. I also take high quality natural fiber to cleanse and detoxify the digestive system to prevent toxic build-up that could damage intestinal walls, disrupt nutrients absorption and constipation problems. From my reading I learn that Nature fills her foods with valuable nutrients. Man fills his food with refined sugars, processed salts, trans-fatty acids, fillers, texturizers, flavours, preservatives and colouring agents. I prefer Nature Made Foods to Man Made Foods that are loaded with chemical additives and nutrients denatured by high temperatures during the processing. 5) Do my exercise with sweating, chi-kung exercises and meditation to reduce stress and enhance my peace of mind. During the rainy days, I relax in my sauna to sweat! 6) Reduce stress from my occupational works. Stay happy and bright regardless of what others may say or do. I like to listen to music – the soft melodies provide much relief from stress before bedtime. 7) Detoxify my body by taking herbs like LL-tea or Mountain Guava Tea and drink properly filtered water. By drinking properly filtered water we can prevent and also eliminate the elevated levels of commonly used chemicals and pesticides stored in our body tissues which cause many types of degenerative diseases and cancers. I now realize that tap water contains harmful toxic chemicals and pesticides and boiling cannot eliminate them. I used only glass bottles whenever possible to fill my herbal concoctions and drinking water. Steel and polycarbonate bottles are my second choice. When I travel I use polycarbonate bottles to fill my drinking water because they are light. I use non-flouride toothpaste and toilet soap made from coconut oil. For lotion or hair-cream, I use coconut oil. 8) I also avoid all microwave-cooked foods. Even standing near one is dangerous to our health. Foods cooked by microwave oven are denatured, making them toxic. Most microwave oven leaks! I have stopped using non-stick pans or cookwares that are coated with a toxic layer of black material called teflon which is carcinogenic. Grease-resistant paper cups and plates are also coated with the same toxic chemical. 9) I am also in the process of replacing all the amalgams fillings from my posterior teeth to composite fillings to prevent mercury toxicity in my body. Mercury damages our brains, central nervous system and kidneys and is a poison that can slowly kill us! 10) Dr. Chris Teo once told me, SK…..be knowledgeable….read more books. The library is your best source. I have never forgotten those kind words. With knowledge I can make a better decision. Now the library and the internet are supplying me with a never ending source of information and knowledge. I know that I must learn how to heal myself. My doctors and all the resources on the internet and library are my teachers. My wife and family members and friends are my supporters in my healing journey. I am playing a game of chess and my opponent is CANCER, which I know is deadly. I know that if I were to just take it easy I would definitely lose the game. With the above strategies for healing my mind and body as a whole and with God leading the path, I hope one day I can take control of my cancer permanently and win my game of chess.